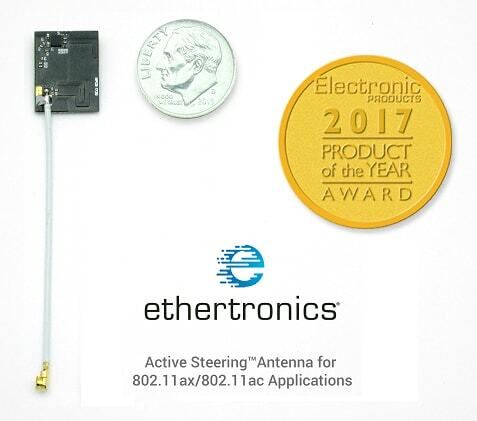 SAN DIEGO, California, January 5, 2018 — Ethertronics, the leader in high performance antenna system solutions, today announced it was honored with an Electronic Products’ Product of the Year Award for its Wi-Fi Active Steering™ platform for access points, gateways and client devices accelerate the next era of Wi-Fi. Electronic Products, which is owned by the media group AspenCore, undertook a rigorous vetting process of products launched in 2017. The winning products were selected on the basis of innovative design, significant advancement in technology or application, and substantial achievement in price and performance. The 2017 Product of the Year Awards were announced in the January 2018 issue of Electronic Products with a cover feature and a brief description of each product. Additionally, the winning products appear on Electronic Products’ website. 2017 marks the 42nd annual Electronic Products’ “Product of the Year Awards,” recognizing the best products in the industry.